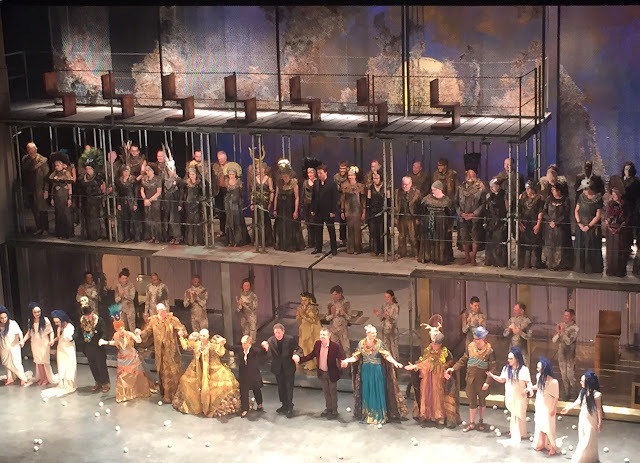 Hypnotic, mesmerising, extraordinary, I had the privilege to see Akhnaten at the English National Opera, the day after the Calder exhibition at the Tate Modern, and the timing was providential, both celebrating a vision of the world that was ahead of its time. Akhnaten describes the story of the eponymous pharaoh, who, with his mother Queen Tye and his wife Nefertiti, sought to instigate sole worship of the sun god Aten, the first instance of monotheism in history. He was eventually overthrown by the priests of the old religion and ultimately replaced by Tutankhamun. Both the opera and the history came onto my radar thanks to the involvement of Gandini Juggling and a tangential project with the ENO community at the British Museum (See Chapter 133 ). I had gone for the juggling and been ambushed by the music. In the days that followed I was restless, edgy, the music was on repeat play, until a friend popped by one day. "That's Philip Glass, isn't it?" she asked, identifying in a (heart)beat her all-time favourite composer. I then showed Carolyn the tantalising tease of the ENO's minute-long trailer (click here). We found seats at the front of the gods for the very last night, not quite together, but trusting in the fates to rearrange. Which they did, placing us next to a very gracious Chinese student, a musical-loving opera virgin, cutting his teeth on Glass. What brought you here? I asked, after our round of musical chairs. Phantom, he replied. You? Me? Barnum. We spoke the same language. "Open are the double doors of the horizon; unlocked are its bolts." The memory of those words of the dead spoken, rather than sung, in Zachary James' bass boom, still reverberate in my memory. They invoked the dawn of a new era, and the soul-searing chorus that followed was terrific. 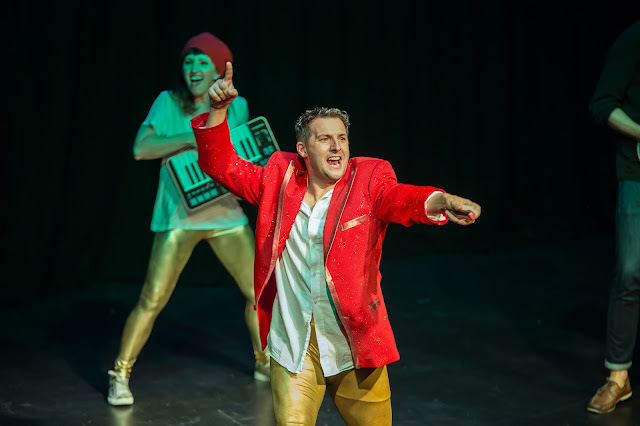 In the upper echelons of the stage, the jugglers, like mobile hieroglyphs, were scoring the air with balls of musical notations, their identikit amorphous hooded bodysuits, patterned liked rocks, blending into the very fabric of the opera's architecture. Calder came to mind again, with his love of collaboration in theatrical projects, emphatic that his work should not be seen as window dressing but integral to the performance, in the work in Chef d'orchestre (click here) the movement of his mobile "conducted" the music, and it was precisely this cross-fertilization of art forms that excited me about seeing Gandini Juggling in action. There was something silkily oneiric about the staging of Akhnaten, resplendent in the worship of the sun that illuminated the set design. The juggling created a certain tension initially. What if there was a drop? There wasn't. But I wondered for a moment at the concentration that must be required for jugglers to function under sort of that pressure, and was nervous on their behalf, until the grace of the mesmerising, repetitive motion gradually drew me under, into a state of consciousness that was both aware, receptive, and yet detached. Together with the visual, the tubular bells and percussive instruments had a meditative quality. The other-worldly siren voice of counter-tenor Anthony Roth Costanza's Akhnaten that hypnotised at the British Museum and drew me here, now harmonised with Rebecca Bottone's Queen Tye and Emma Carrington's Nefertiti to haunting effect. The lyrics, for the main sung in a combination of Hebrew, Egyptian and Akkadian, resisted interpretation due to the absence of subtitling. As a result, I found myself prevented from decoding the language and unlocking a clear narrative, struck instead by the impression of a series of tableaus, representing an age-old conflict that once was, and is still being lived out today. I wonder what Einstein would have made of it? After all he spent 45 minutes, the length of each of Akhnaten's three acts, spellbound in front of Calder's Universe (see previous post). I imagine he would have delighted in the arcs of juggling and loops of music weaving in time. Einstein is the subject of another Glass opera, Einstein on the Beach that together with Akhnaten and Satyagraha (about Ghandi) celebrate visionaries in the field of science, religion and politics respectively, so no wonder he strikes a chord. First to our feet at the end, Carolyn and I, and our musical friend, were delighted to see the rest of the audience follow suit in thunderous rapture. I took a snapshot for posterity, inadvertently capturing Philip Glass on stage in the process - how wonderful that he was there to witness such a triumphant production. A very special night indeed. Bravo! - The recording of Akhnaten is available on BBC iPlayer until the end of April (at www.bbc.co.uk/programmes (click here). - Director Phelim McDermott is taking the production to Los Angeles, and you can see it at the LA Opera in November. - The Circus Diaries has a fascinating and comprehensive review of the opera, including the juggling elements: www.thecircusdiaries.com (click here).